Audio is the new video: Will podcasts take off in Europe? podcasts take off in Europe? According to PRCA’s predictions, 2019 will be the year of podcasts. This is great news for digital communicators as podcasts can be a very effective channel to reach specific publics as well as achieving communication and business objectives. Here’s a fun fact: back in the 1980s, podcasting used to be termed “audio-blogging”. For those who are still uncertain on what this term means, it essentially refers to a method of broadcasting audio files online to be downloaded and played on mobile devices – sometimes also referred to as ‘radio on demand‘. Think of podcasts as bite-sized radio shows that you can download and listen to while you’re on the train, waiting for a doctor’s appointment or queuing to get a coffee. Podcasts are increasingly popular with listening figures growing steadily. The uptake in smartphone usage is the main driver behind the current podcast boom, mainly because of their portability and ease of use. In 2018, for example, 69% of Americans listened to podcasts primarily via their mobile phones. This is also the main reason why podcasts have now become more popular than blogs, according to Google search statistics. The vast majority of podcasts are free to download and listen to – simply browse podcasting directories such as iTunes, Soundcloud, Spotify, Google Podcast, iHeartRadio or Stitcher. Curious to know more about podcasts and the enormous potential these hold for professional communicators? Then keep on reading! Recently, consumer adoption of podcasts and other voice-driven technologies started rising significantly: although smart speakers entered the market only a few years ago, they are already having a huge impact on people’s lives. Podcasts, on the other hand, have been around for quite some time but only now they’ve reached a critical mass of listeners. In fact, at the end of 2017, already 50% of US homes identified as podcast fans. In contrast, it’s taken European consumers much longer to adopt podcasts, but now, they are growing quickly in popularity – at least throughout Northern Europe. In Sweden, for example, podcast listening figures grew by about 36% in just two years and a total of 16% of Swedes listen to podcasts every week. Their French counterparts download an average of 17 podcasts and listen to 14 podcasts every month. In Germany, estimates state that about 15% of the population listen to a podcast at least once a week – up from only 7.5 million back in 2016. Southern European consumers are more hesitant, however. Take Italy for example, where newspapers, such as the daily La Stampa, refer to podcasts as an “American trend” and claim that just 1% of Italians actually listen to podcasts. There is a similar situation in Spain where, according to the Asociación para la investigación de Medios de Comunicación, podcast listening represent less than 2% of the overall radio listening figures in the country. Is there a ‘typical’ podcast listener, globally? As podcasts are still relatively new in Europe, there aren’t many demographic data points available on European listeners. However, one study claims that German podcasts fans, for example, are generally younger, have higher levels of higher income and education and have generally more favourable views of technology and media. This mirrors findings from the US, where podcasts listeners are also generally wealthier and more well-educated compared to the general population. According to the Podcast consumer 2018 study, 51% of US monthly podcast listeners have a household income of over $75K and 83% of podcast listeners are college graduates. To top it off, podcast listeners are also more likely to follow companies and brands on social media, perfect for organisations looking to engage with their audiences. Interestingly, 70% of podcast listeners use ad blockers but, when it comes to podcasts, they are not likely to skip an ad read because they don’t want to miss any part of the show. And, since ads are usually read at the beginning, in the middle or at the end of a show, with 40% of people listening to entire podcasts and 45% listening to most of the podcast, brands get multiple opportunities to leave an impression. The huge popularity of podcasts is a key factor for brands’ increasing investments in podcast ads and sponsorships. Also, 67% of podcast listeners don’t mind sponsorship messages and occasionally find them useful, which is a world of difference compared to the 6% of TV or radio listeners who feel the same. 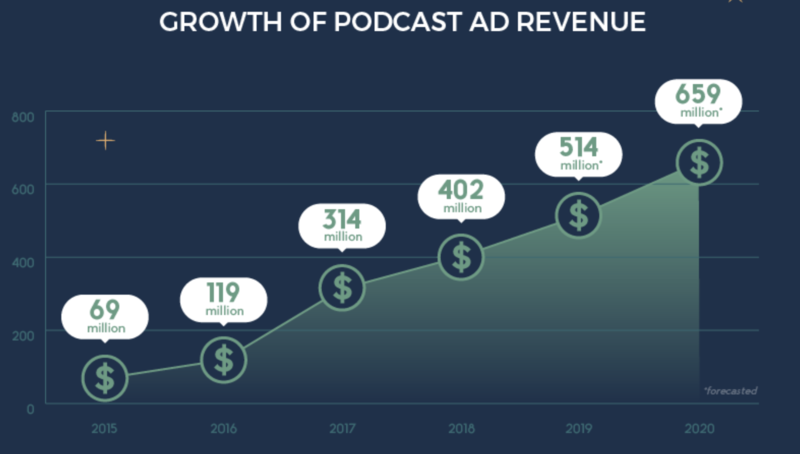 Estimates by consulting firm PwC and the Interactive Advertising Bureau (IAB) predict that ad revenues for podcasts will have doubled by 2020: from an estimated $314 million in 2017 to $659 million. Take the example of BMW and Chanel. Both companies advertise on “The Daily,”, a podcast from The New York Times, which is less than two years old and currently attracts about 5 million unique listeners a month making it one of the most popular blogs in the US. When it comes to ad formats, the so-called “baked-in” format – ads read by the presenter – are the most popular ad type, others formats are pre-produced ads, live-read ads and dynamic ad insertions. Podcast directories as well as software and service providers jump on the opportunity. Take Spotify for example: the Swedish company decided to invest more in its podcast business arm as well as in advertising its own music streaming service by means of podcasts ads in 2019. Spotify expanded the number of available podcasts in its catalogue, it also started creating original podcasts hosted by notable influencers and has recently acquired two companies: Gimlet Media, an award-winning audio and podcast production company and Anchor, a podcast production platform. According to a report by measurement and analytics company Nielsen, podcast ads lift listeners’ purchase intent. For example, 69% of the survey participants claimed that podcast ads made them aware of a new product or service. So, why are podcast ads so effective? One of the main reasons here is that ads are fully integrated with the show and not seen as external content. Read by the podcast hosts themselves, ads appear more of a personal endorsement from authorities listeners have grown to know and trust and are therefore perceived as more credible. Still hesitant on podcasts’ effectiveness? Read on for more business benefits! As Miranda Katz, former Wired writer puts it: “People are really listening and want to consume all of the content that is there and available. There’s a level of dedication that comes from podcast listeners that you otherwise don’t find. Podcasts aren’t a bubble, they’re a boom”. With a podcast, business owners and professionals may share their expertise on certain topics and position themselves as a thought leader in their industry. At the same time, these professionals also get more exposure for their company or brand. On this note: leveraging the influence of noteworthy guests is a great way to get more eyeballs on a podcast! Consider this: until recently business communication happened only through printed hard copies or emails. But today the effects of digitalisation and a workforce increasingly made up of millennials have increased the demand for audio and video communication and that’s where podcasts come in. Because you’re reaching out to your consumers using a medium that’s perceived as more intimate and personal, they’re more open to what you have to say. This allows you to position and promote your company or services more effectively. Podcasts are easier to consume than other forms of media (such as videos and blog articles) – as mentioned earlier, listeners can simply tune in to a podcast while waiting in line at the store, or even while they’re at the gym. Additionally hearing the voice of the presenter gives the audience a stronger connection than simply reading the information on a web page. As the producer of a podcast, this is great news – because there’s a higher likelihood of your followers being loyal to your show and continuing to watch out for each new podcast which you release. Once you jump on the podcast bandwagon, unfortunately there is no global standard to measure Podcasts. In Sweden, there is an interesting project aiming at creating a ‘Podcast Measurement Standard’ proposed by a working group of various media organisations. Key metrics are “listens” and “reach” – you can find more detail about this ongoing work here. More pragmatically, metrics that you should be tracking include unique downloads, subscriptions, backlinks and social sharing. If you notice a steady uptick of people downloading and subscribing to your show and sharing your links via social media, then that’s a sign that you’re on the right track! As of now, there are not many tools that help communication professionals measure the success of their podcasts except for hosting platform analytics like Apple podcast Connect, Libsyn and Transistor’s, for example, which are still limited to showing raw numbers only. But there are also other creative ways to measure the success of your podcast which can be monitoring the number of mentions the podcast gets in chat rooms, social networks communities as well as through monitoring hashtags and conduct surveys. That being said, for those promoting a service or product via their podcast, a workaround is to offer a unique promotional code to your podcast listeners. Make this something easy to remember – such as SHOWNAME20OFF. This way, you’ll be able to quantify the number of people who listened to your podcast and converted to a paying user! Don’t forget how important it is for your content to be found on the web and podcasts are no exception: if podcast search engine optimisation (PSEO) is not a thing yet, it should be. Keep in mind to always optimise your podcasts for search engines and media libraries: Make sure you choose a clear title that suggests what you will be talking about, also optimise and update your RSS feed since that’s what provides all the information about your podcast in media libraries and finally build backlinks to gain the required authority. Podcasts have been growing slowly but surely in Europe and we foresee that the floodgates have now opened up with Google’s official recent launch of its standalone podcast app for Android available in the Google Play Store. Podcast market penetration depends heavily on the devices people use and Europe is largely Android-based as only 25% Europeans use Apple’s iPhone which comes with a built-in podcast app. 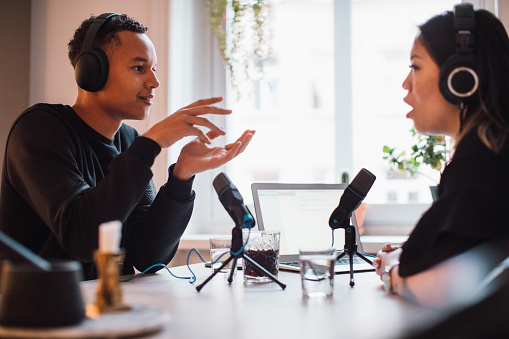 Communication pros will do well to capitalise on this window of opportunity – it’s the perfect time for you to build your podcast following so that more eyeballs will be on your organisation. We at Ubermetrics love to listen to podcasts – click here or the pic below for a list of our favourite podcasts for marketing and PR experts. Ubermetrics Content Intelligence platform can be of help throughout the entire podcast content life cycle. Talk to us today to find out how!